I know. 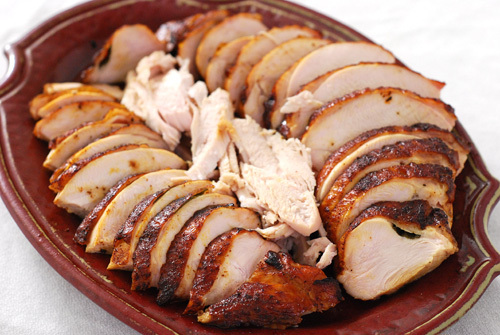 You just got over your turkey overdose. Why in the world would I be making turkey now? Because I didn't get to at Thanksgiving. Normally I like to brine my poultry but this breast was one of those "packaged with up to X% with a solution" so it was already pre-brined so brining it was not an option. Instead I came up with an injection to build flavor. This turned out to be my favorite injection I have come up with for turkey and the family readily agreed. The clarified butter has a cleaner texture, the infused herbs bring the flavor, and the sweet agave comes through in the final product. Heat clarified butter to simmering. Add the garlic cloves, sage leaves, thyme, and peppercorns and poach for 5 minutes. Remove and reserve the sage and thyme. Discard the garlic and pepper corns. Add the wine, Agave nectar, and salt. Stir to mix. Remove from heat and allow to cool before using. Note: Our local grocery store carries Agave Nectar. If you can't find it, you could substitute honey and a little brown sugar. But agave has much better flavor, in my opinion. Sage and thyme reserved from cooking the injection. Preheat your grill to 325 - 350f set up for indirect heat. I was using a Smoke Hollow combo grill with 40 lit briquettes divided to each side with drip pans in the middle. See pictures below for example. 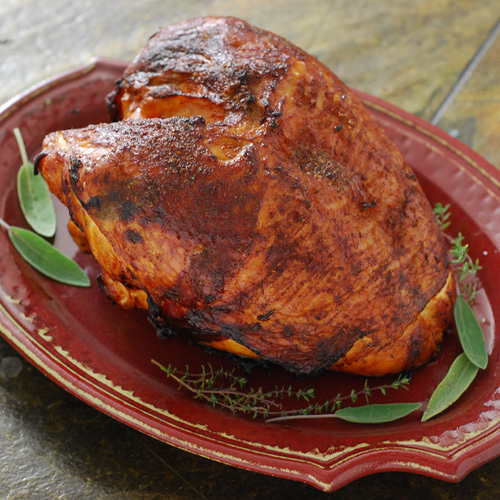 Make a rub with the salt, paprika, pepper, thyme and sage. The thyme and sage should crumble easily. Rub the breasts over and under the skin. Place the breast on the grill over the drip pan, skin side facing up. 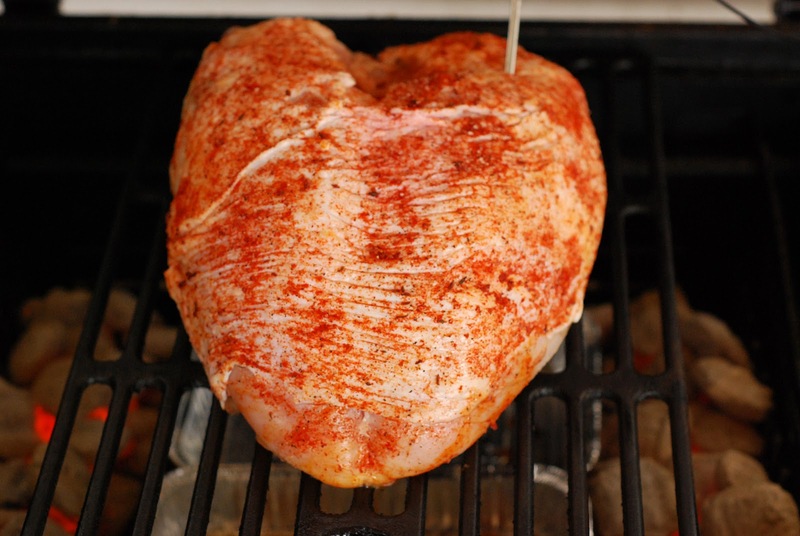 Grill for 2 to 2 1/2 hours or until the breast reaches an internal temperature of 155 to 160f. 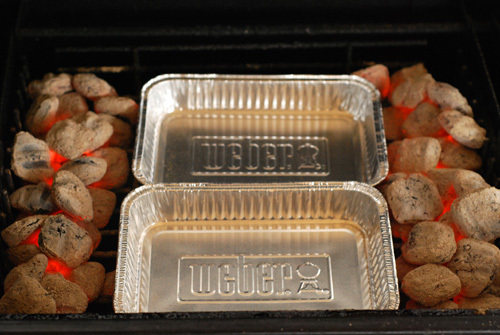 Add a half dozen or so briquettes to each side occasionally as needed to maintain the grill temperature at 325 to 350f. I used Kingsford Briquettes with Hickory (green bag) to get a little smoke flavor. Here's my time/temps chart. [Update] The grill temps listed were actual temps, not my target temperatures. I was trying to hold a temp of 325f, which is much easier in my Eggs. 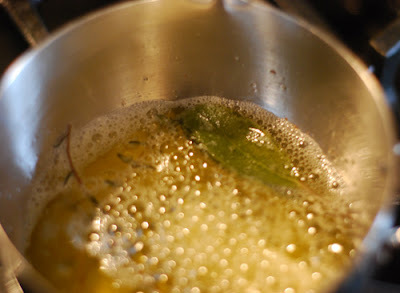 Poaching the garlic and herbs in butter draws out their flavor. 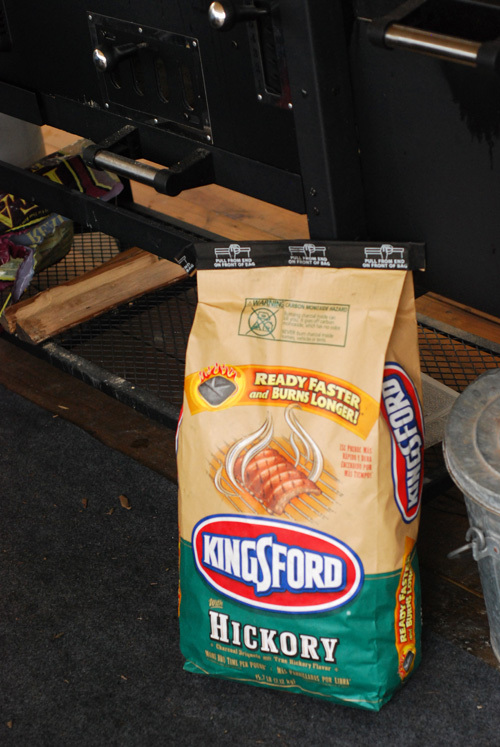 Kingsford with Hickory adds a kiss of smoke. 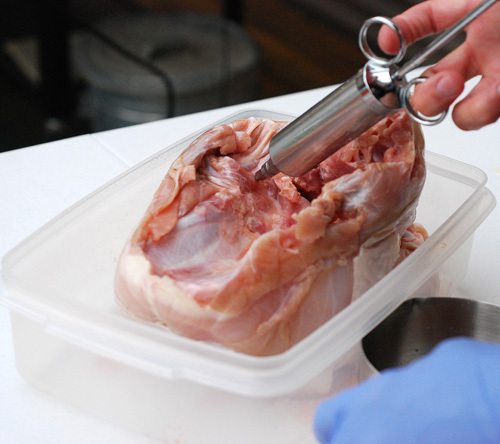 Injecting from the rib side (inside) avoids tearing and poking holes in the skin. 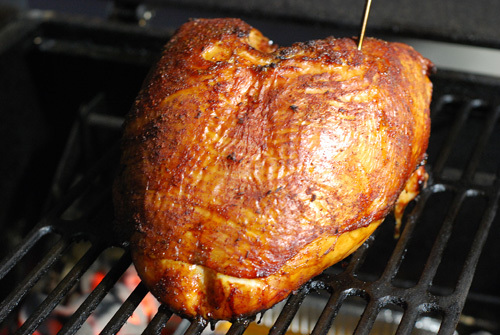 Indirect set up, coals pushed to the side to create a void, above which rests the meat. Look how juicy! 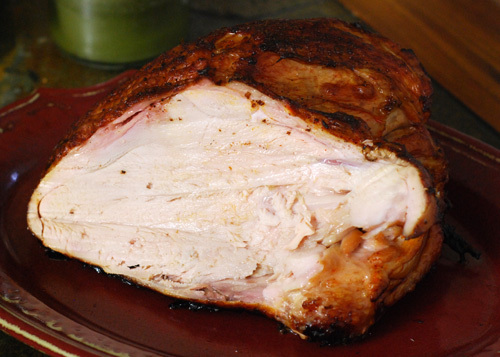 I carve off half the breast and then slice that on a cutting board. This disappeared quickly but I did manage to save some scraps for KY Hot Browns today. Don't forget to entry the Drapers BBQ Gift Pack giveaway HERE. [Standard Disclaimer] I receive no compensation for this post from any of the brand names listed.